Happy Friday everyone! First post of this morning will be Beate’s wsc. With Stampin’ Up! having a chipboard special, I thought it would be appropriate to showcase a chipboard card. How fun! Great bright card for any upcoming graduation party. This will be my intention with this sample. I used 3 different chipboard assortments on this card: On Board Ginormous Pieces, Blossoms & Basics, and Lots of Letters. There are many adhesives to choose from for adhering your paper to chipboard. I have found that a glue stick is the fastest method. I use a sanding block for larger areas, and then I fold up sand paper into a tiny roll for all the detailed/hard to get to areas. How about all the glitter? I used Mini Glue Dots to the scalloped punch piece of Wild Wasabi CS and applied Celery Fine Cosmo Stampin’ Glitter. I also wanted to continue to glitter theme (but not to take over the whole look of the card), so I added Sticky Strip to the Wild Wasabi CS matted base and added the glitter here as well. The Sticky Strip is 1/4″ wide and that was a little too much for me. I covered a portion of the glittered Sticky Strip with my DSP to get just the right amount showing. Thanks for stopping by. Have a wonderful holiday weekend. CARDSTOCK: Whisper White, More Mustard, Tempting Turquoise, Wild Wasabi Textured CS, East Coast Prep DSP. INKS: Real Red and More Mustard. Tempting Turquoise Craft. ACCESSORIES: Earth Elements Brads; Jersey Ribbon Originals; Mini Glue Dots and Sticky Strip; Sanding Block and paper; Fine Cosmo Stampin’ Glitter; On Board Ginormous Pieces, Blossoms & Basics, and Lots of Letters; Scallop Punch; 1/4″, 3/4″, 1-1/4″, and 1-3/8″ Circle Punches. 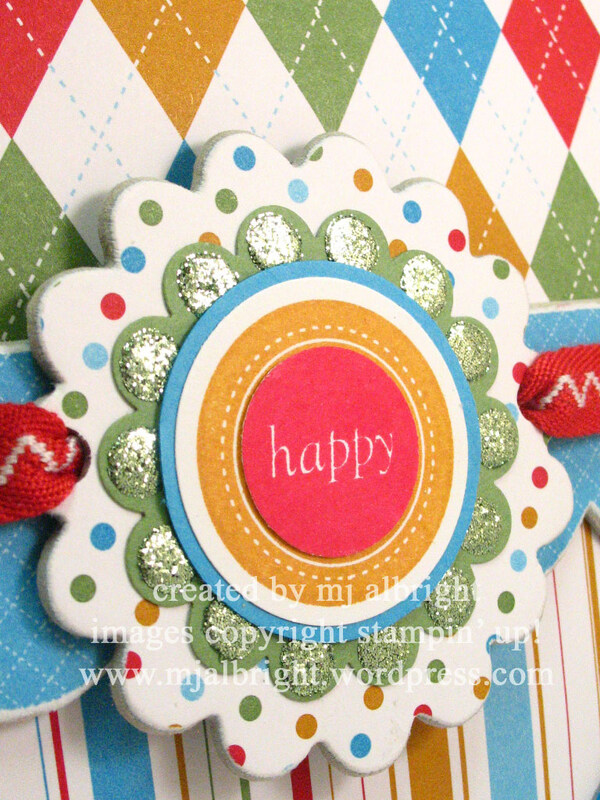 Oh what a fun, bright card Mary Jo! I LOVE it! So happy! Have a wonderful weekend! MJ, your card looks amazing! I Love how it showcases the glitter and the chipboard. How wonderfully fun with so much detail and dimension — I love the 4U!!! Love everything you’ve done with this card–I forget how easily glitter can be added with Sticky Strip and Glue Dots. Fabulous work. Congrats on the Artisan Award win this year–I can’t wait to see some of your projects and hope Stampin’ Up! will publish them for all to see sometime soon! Love all that chipboard!! You make it look so easy…Bright cheery colors! Just wonderful! Have a fabulous weekend! woo-hoo! The summer is HERE! OH MJ…this card just screams FUN! I love it! The colours are wonderful and all the glittery chipboard…wow! Fantastic! Wow, love all that chipboard, MJ! What bright, fun colors, too — love this card with all the bling! I LOVE this!!! The glitter around the edge is just genius!!! You are so talented, Mary Jo!!! This card is SO FUN! You do such awesome work! Thank you for sharing and have a wonderful weekend! Darling!! Love the fun, cheery colors and patterns!! Awesome use of the sketch and chipboard too! Can I just say this card brings me alive just to look at it! It’s so bold, bright, beautiful, sparkly….I could go on and on! It makes me feel like I want to go out and conquer something….or at least get all of my beautiful wildflowers planted!…..10,000 square feet to be exact! lol! My 13 year old said “Mom! I want my room just like that card!” Awesomely wonderful! I love the idea of the sticky strip and glitter! Mary Jo I just found your Website and your talent shines. Congratulations on the Awards you have recieved. They are all so nice I can’t pick out a favorite! PS Ethan is pretty cute too!!! !